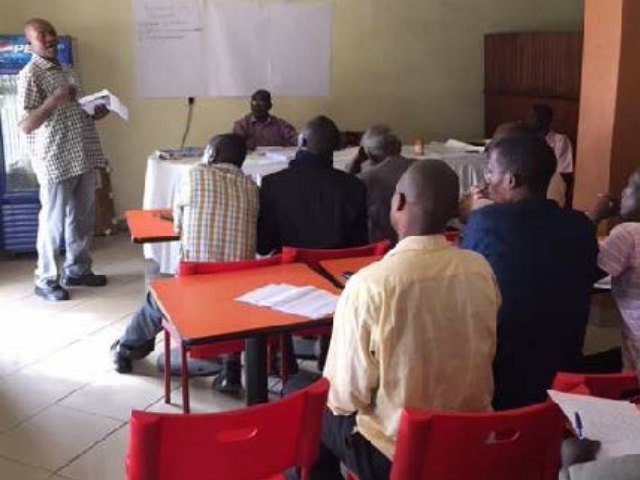 The four-day residential course was run by Daniel Ngangasi and Simon Byongo from LIDEFO (Liberty Development Foundation) in Kasese some 220km from the homes of the Murambo beekeepers. It was part of an ongoing development project for them. Bees Abroad have built up a close relationship with Daniel and Simon and they provided an outline of what the course should contain. Daniel and Simon produced the course programme and taught a great course which included classroom and practical beekeeping sessions. It was the first such course run by LIDEFO. Bees Abroad paid the course fees, accommodation, food and travel for the attendees. This was effective in removing barriers for people so they were able to attend the course and resulted in a really enthusiastic group. 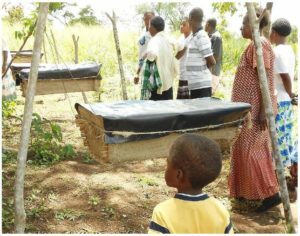 The group consisted of four pairs of attendees from small local beekeeping groups in the Murambo district plus two individuals representing other groups and the district coordinator, Ezra Sigirenda. 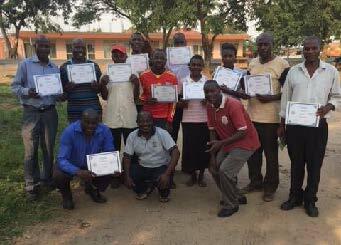 The aim was for them to take the knowledge acquired on this course and disseminate it amongst the other beekeepers in their local area. They were a keen group – we started the morning session 10 minutes ahead of schedule every day! They were very focused on learning and all took copious notes and photographs. The attendees arrived on the Monday evening on the local bus after a full day’s travel. Well cooked local food was provided by the hotel. Notepads and pens were provided to all of the attendees and their first task was to write an introduction to themselves and their beekeeping experience to be presented the next morning. 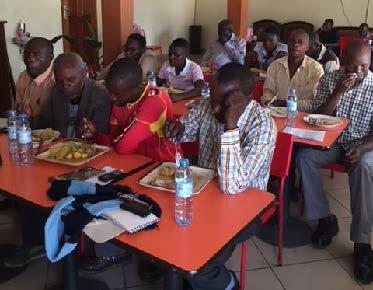 The course started with breakfast on Tuesday and moved directly on to the individual presentations. About half of the attendees were from beekeeping families. 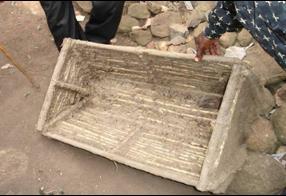 Many were using traditional basket hives, with some using Kenyan Top Bar Hives. They wanted to learn how to increase their honey production by adding more hives, managing their bees better and dealing with diseases. Daniel spent the sessions teaching about beekeeping, such as differences between the queen, workers and drones while integrating the business information such as the amount of space needed to create an apiary and how much honey and therefore money could result from a fairly small area. The practical element of the course was taught by Simon. 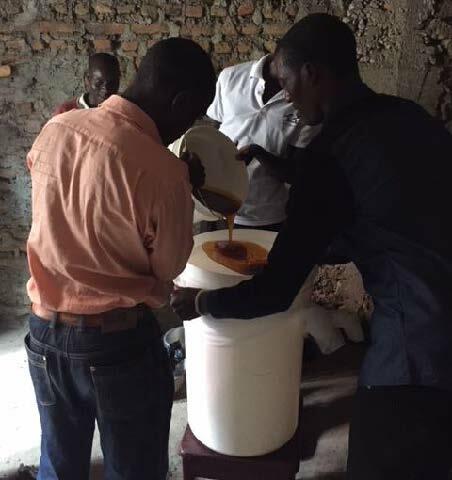 This included how to filter honey, how to melt the wax and an introduction to Kenyan Top Bar Hives. 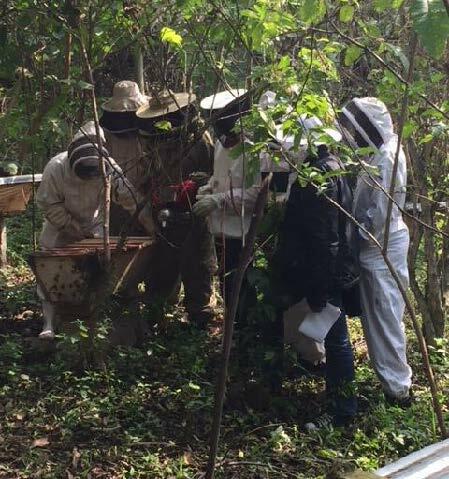 There was a group apiary visit and a visit to LIDEFO’s honey storage and bottling room and some hands-on bottling practice. I hope that this course has encouraged the attendees to take both small steps such as clearing vegetation around their apiaries and larger steps such as starting to set up beekeeping co-operative groups in their areas with a view towards producing commercially saleable honey. 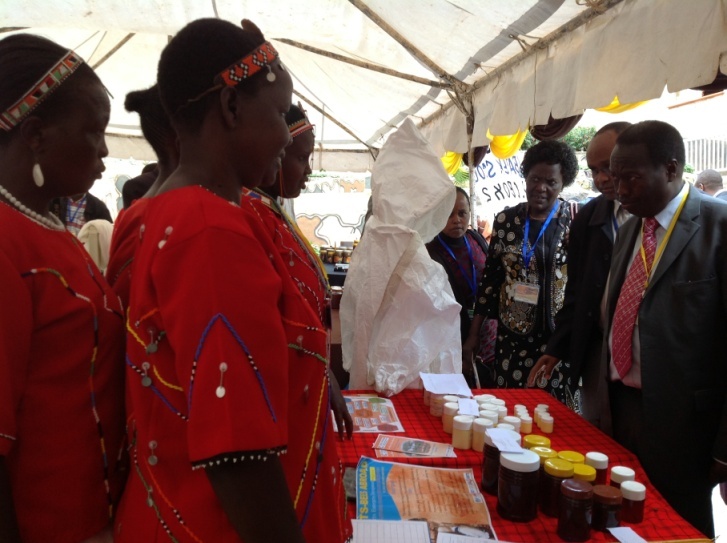 A three year BeesAbroad project in Kenya which was funded by DFID funded project has been recognised for it’s significant contribution to the goal of poverty relief in the area. DFID deemed that the outcomes of the project, which had a budget of £246,798 controlled by Bees Abroad, had exceeded expections, were ‘highly relevant’ and ‘incorporated value for money aspects particularly related to economy’. 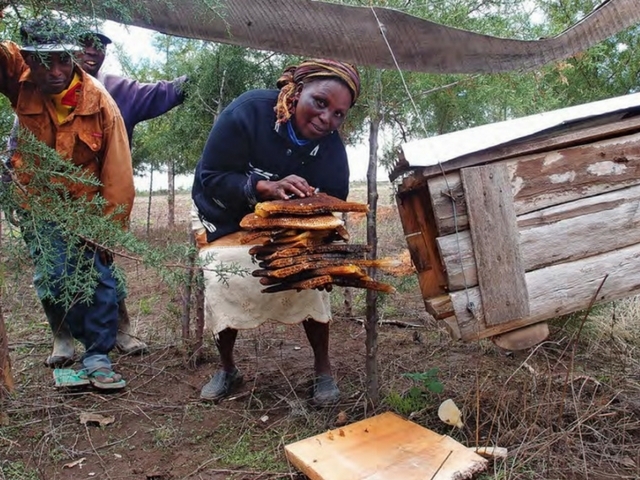 11 of the beekeepers’ groups set up attained quality certification from the Kenya Bureau of Standards. More than 450 households reported planting five or more bee-friendly trees or shrubs. BeesAbroad are very proud of this project and look forward to many more similar successes in the future. Many thanks to Bees Abroad volunteers John and Mary Home who managed the project together with David Evans as project accountant. 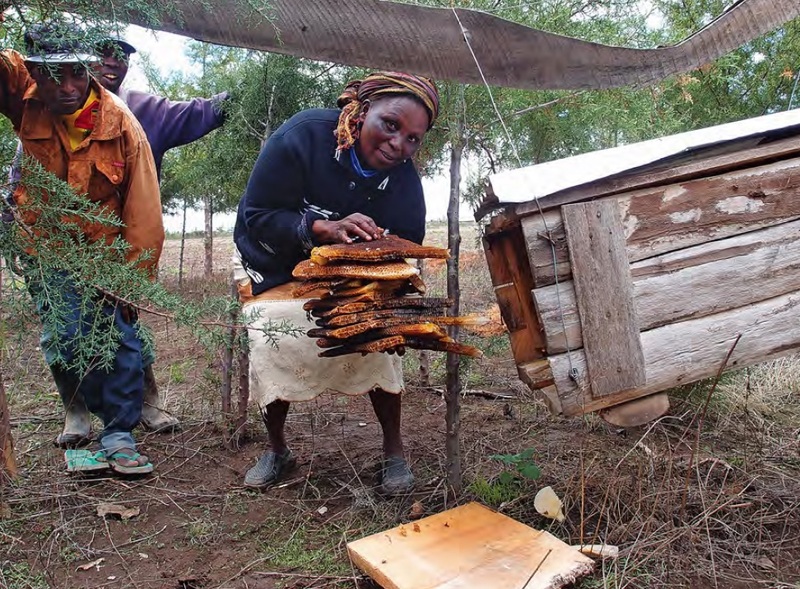 Liz Bates has written a wonderful article in the magazine BeeCraft, explaining how the migration of honeybees in Kenya is part of the natural rhythm of beekeeping in a region with two rainy seasons. She also demonstrates how, with help from Bees Abroad, these communities are sourcing hive equipment locally, and making valuable products. We’re delighted that BeeCraft have let us reproduce Liz’s article on our website. 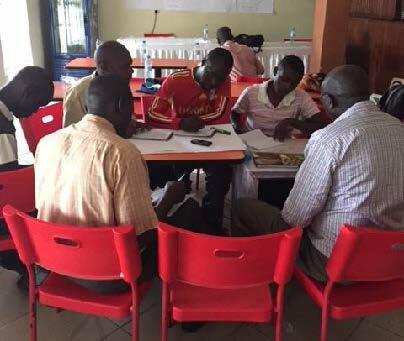 Roy Dyche and Geoff Redwood have recently returned from Hoima in Uganda, where they have been supporting and evaluating our project there. 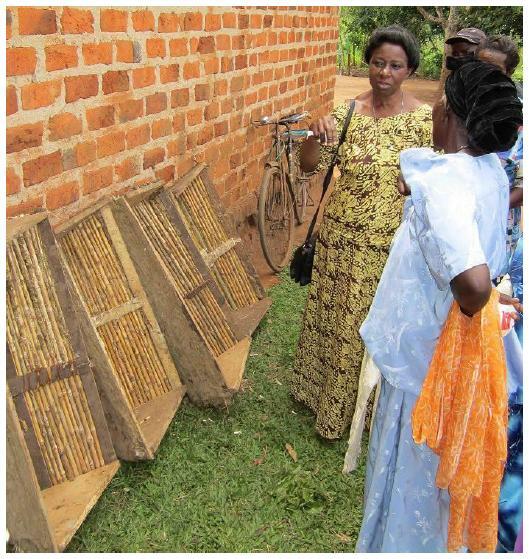 The project was begun in May 2012, its aim being to help vulnerable women in Uganda’s Hoima District to provide for their large households by introducing them to modern, environmentally sustainable beekeeping as a source of much-needed income. 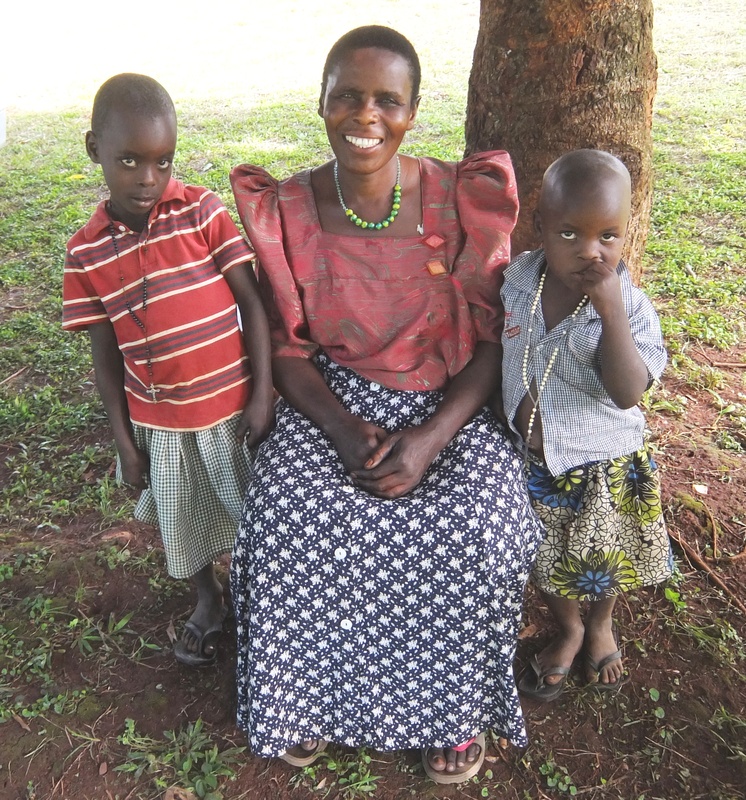 Many of the women are widows or single mothers, and nearly all are subsistence farmers growing little more than they need to feed their families. The average household has between six and seven members, well over half of whom are children of school-going age or younger. The implementation of the project is being handled by our local partners, the small Bigasa Sustainable Development Foundation (BISUDEF). Together with BISUDEF, we are helping women’s groups in Hoima District to undertake beekeeping or improve their existing beekeeping by training them to construct, manage and harvest Kenyan topbar hives. 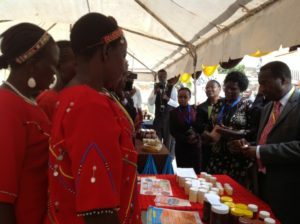 They have also been shown how to add value to their wax; and they are being provided with a ready market for their honey via a new buying & marketing operation run by BISUDEF. Our members are organised in groups on a geographical basis and at the start of the third phase, which has just ended, four more groups were added to the twelve which already existed. This brought the total number of our direct beneficiaries to 170. When the rest of their households are included, over a thousand people now stand to gain from the project. 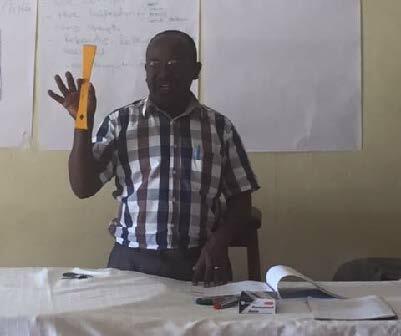 The four new group leaders (GLs) had been trained as members of earlier groups and had passed this training on to the new recruits. We had given them bicycles to make it easier for them to reach their members at their homesteads. The groups themselves had been issued with inputs similar to those earlier groups had received; for example, smokers, protective clothing, gloves and food-grade buckets in which to store their honey. 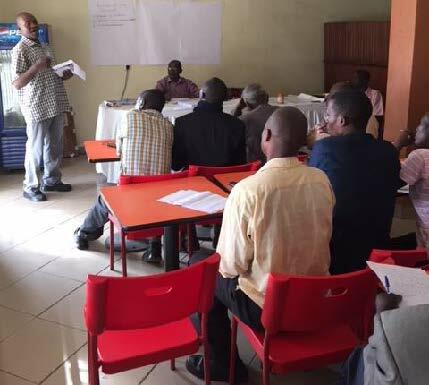 After the initial training, BISUDEF’s field officers had visited all sixteen groups regularly in order to offer advice and any supplementary training that was needed. Although by the end of the third phase there had been a pleasing increase in the number our members’ hives that were colonised with bees — 22% last year, 51% this — the amount of honey taken from them so far this season had been disappointing. The explanation was clear. Traditionally the harvesting season lasts from February, soon after the rains begin, and ends in May. This year the rains did not start till March 2015, so harvesting had been delayed by four weeks or so. We are hoping the season will redeem itself by extending into June. BISUDEF’s buying and marketing operation had gone well during the phase. For reasons already given, the buying side of the business had been slow this season but they were now selling nearly twice as many jars of their ‘Family Life’ honey to local stores. Despite the modest harvest so far, the morale of our members remained high and the GLs had proved as committed and conscientious as ever, as had the BISUDEF team. There will be no further material inputs for our members, but because people do not acquire the knowledge and confidence to manage modern hives in just a year or two, the longer they can rely on BISUDEF’s technical support, the better. For this reason the field officers will continue their regular advisory visits for another twelve months. We will also continue to enable group leaders to attend the monitoring meetings in Hoima town, by providing the cost of their transport to and from the town. To help sustain the project’s considerable achievements, we aim to organise our beekeepers into an officially registered women’s beekeeping association, with the GLs constituting the core management. In this way the GLs’ esprit de corps and management skills will not be lost and the women’s beekeeping will be put on a near autonomous footing, largely independent of BISUDEF. 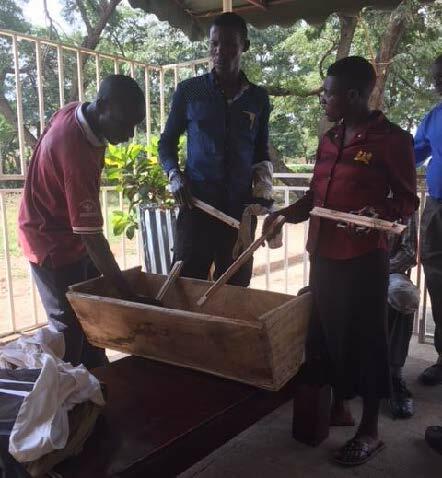 Bees Abroad have recently been partnering with Ashanti Development in the Ashanti region of Ghana to train members of this rural community in the skills and practice of beekeeping. 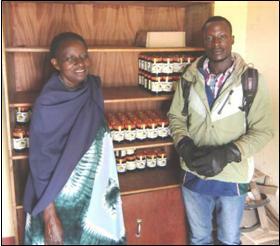 This is another great example of how Bees Abroad helps to relieve poverty. Antonella Sinopoli has made a video based around the running of this course, which can be viewed at this link, and features some of the Bees Abroad project officers Brian Durk and Ashanti Development project managers Dawn Williamson and Paul Bloch, as well as Bees Abroad trainer, Victor Ayeebo. You can read more about the work of Ashanti Development at their website. As an example of the impact projects such as this can have, here is a photo of John Partey, a beekeeper in Bimponso, near Twifo Praso in the Central Region of Ghana. John recently told us that he has been able to fund sending his son Joseph firstly to Polytechnic and is now going to send him to University. All this from the honey produced from 17 colonies of bees. John has been helped on his journey to successful and profitable beekeeping with support from Bees Abroad, through our Twifo Praso project. 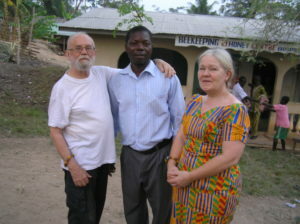 John is pictured with Brian Durk and Caroline Luxford. 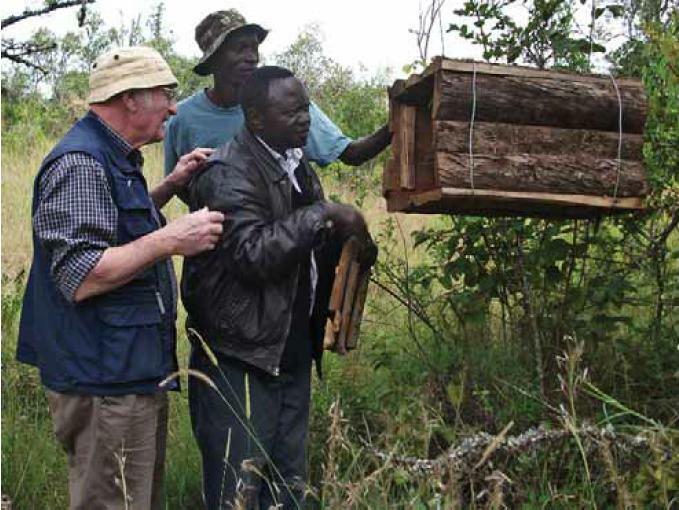 Bees Abroad project manager Roy Dyche talks to a member of our Ugandan project. 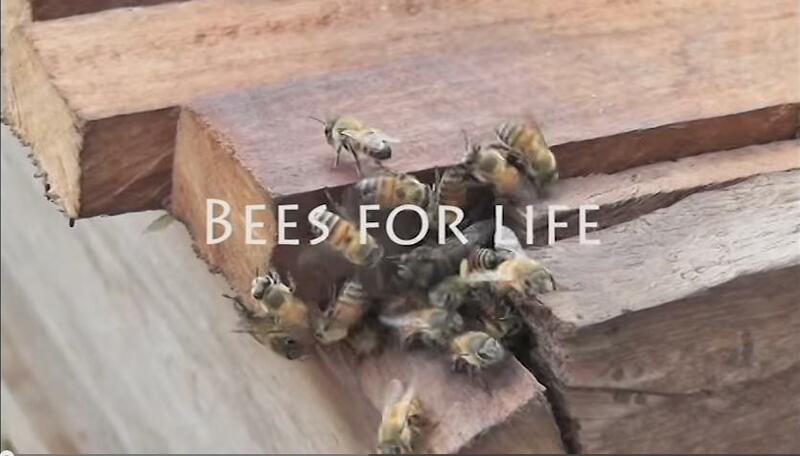 “So many of my friends were telling me about the beekeeping that had arrived in our district. I was excited. 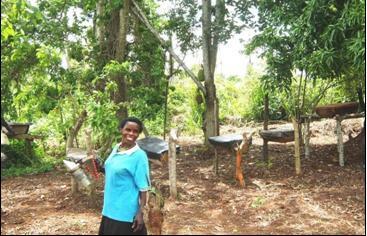 I wanted to become a beekeeper too, so I decided to join the project.” And this is what Beatrice Kamaujobe had done. A year earlier, when two more women’s groups were added to the project, she enrolled in one of them. “Grace, the leader of my group, was very good. She trained us well. The BISUDEF field officer also gave us a lot of help. I already feel like a real beekeeper.” (BISUDEF is the small local organisation which is implementing the project as our partners). I was to see later just how well Beatrice had been trained. First I wanted to know a little more about her and her family. “My husband and I, we are farmers. We grow enough to feed ourselves and the children and a bit more to sell at the market — maize and rice. We scrape by but it’s a struggle. I wondered why she was paying fees when education in Uganda was supposed to be free. She invited me to see her hives, which were sited on the family plot not far from the house. I was impressed. 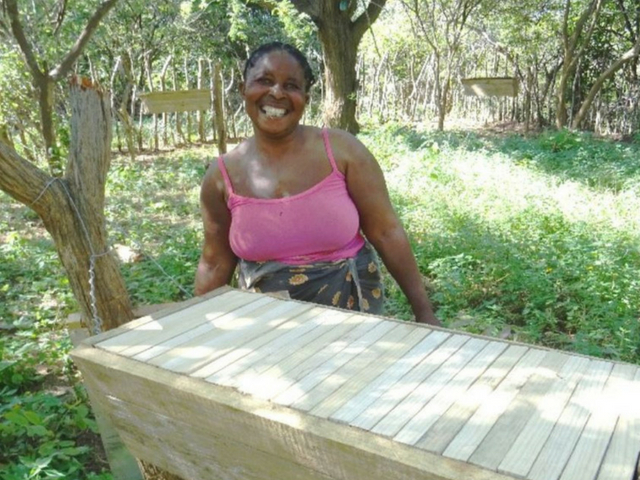 She had made six modern hives for herself and installed them in her apiary, a small area from which the vegetation had been completely cleared to deter lizards and ants, the scourge of African beekeepers. The hives had been very well constructed from sticks and a mixture of mud and ash, and were suspended securely from stout poles. Four of the hives had been occupied by passing swarms but the bees had only quite recently taken up residence so I assumed they hadn’t provided her with any surplus honey yet. It certainly was a good start. 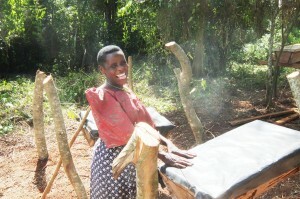 £8 wouldn’t go far in the UK but a Ugandan villager can do a lot with 30,000 shillings. So was she happy with how the year had gone? “Very happy! 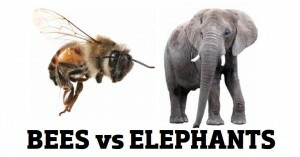 I’m more confident with bees now. They don’t frighten me the way they did. But I still find it a bit difficult harvesting my honey because I don’t have my own protective gear. I have to borrow other people’s. There are quite a few Beatrices in Uganda’s Hoima District now, women full of enthusiasm for the project and gaining much-needed financial benefits from it. It’s stories like hers that reassure us all at Bees Abroad — and should reassure our supporters too — that the work we are doing in the developing world is making a real difference. Here are photos of Sinyati women’s group as they exhibited during the Baringo county Honey Conference (26-28 June 2014) which was attended by 500 people and presided over by the County Governor Hon. Benjamin Chebo. In the photos, he is looking at the products on the stand. Stuart Andrews and Roy Dyche will be visiting our project in Hoima, Uganda at the end of April, and you will be able to follow their work via Stuart’s photographic blog. Bookmark the page! 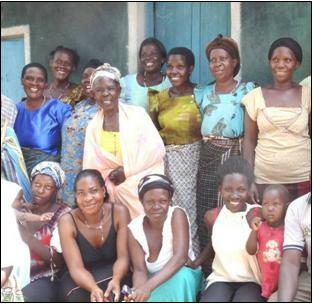 Below is a link to a previous report from this exciting project helping women’s groups living in a rural area of West Uganda.